The USS THOMAS A. EDISON (SSBN-610), an Ethan Allen-class submarine, was commissioned on 10 MAR 1962. Built by the Electric Boat Division of the General Dynamics in Groton, Connecticut, USS THOMAS A. EDISON was involved in a collision with a US destroyer during her shake down training off the East Coast of the US in 1962. THOMAS A. EDISON spent the first four years of her service life sailing on North Atlantic - Arctic Ocean deterrent patrols from Holy Loch, Scotland. USS THOMAS A. EDISON returned to the US for overhaul in 1966-67. After overhaul she served with the Atlantic fleet until June 1973 when her homeport was changed to San Diego, CA. USS THOMAS A. EDISON was overhauled again at Mare Island NSY in 1973-74 and resumed duty with the Pacific Fleet. In December 1975 USS THOMAS A. EDISON changed her homeport to Apra Harbor, Guam. USS THOMAS A. EDISON served her country for 21 years, 8 months and 21 days, until decommissioned on 1 DEC 1983. The hulk of THOMAS A. EDISON was disposed of by Ship and Submarine Recycling Program, Puget Sound NSY, Bremerton, Washington by 1997. Thomas A. Edison was laid down on 15 March 1960 at Groton, Conn., by the Electric Boat Division of the General Dynamics Corp.; launched on 15 June 1961; sponsored by Mrs. Madeleine Edison Sloane; and commissioned on 10 March 1962, Capt. Charles M. Young (Blue crew) and Capt. Walter Dedrick (Gold crew) in command. Following shakedown training off the eastern coast of the United States, Thomas A. Edison loaded Polaris missiles at Charleston, S.C., and embarked upon her first deterrent patrol on 7 November. She concluded that patrol at the base at Holy Loch, Scotland, whence she operated for the next four years and 17 deterrent patrols. In September 1966, her official home port was changed from New London, Conn., to Charleston, S.C., in preparation for her first major overhaul. She ended her 17th patrol at Charleston on 15 October 1966 and began her overhaul on the 28th. She completed repairs on 9 May 1968; and, after post-overhaul sea trials and shakedown, she embarked upon her 18th deterrent patrol on 22 September 1968. Over the next five years, she operated out of New London and Rota, Spain, from which ports she conducted another 19 patrols in the Atlantic. In June of 1973, she was transferred to the Pacific Fleet, arriving in San Diego on 11 July. After a short period of operations with Submarine Group 5, she moved to Vallejo on 6 August to begin another overhaul, this time at the Mare Island Naval Shipyard. On 30 November 1974, the fleet ballistic missile submarine completed repairs and, following shakedown in January and February of 1975, she transited the Panama Canal again in March to fire test missiles near Cape Canaveral, Fla. She concluded that mission in July and retransited the canal on 8 August. Thomas A. Edison carried out operations along the west coast until December at which time she headed for her new home port, Guam. 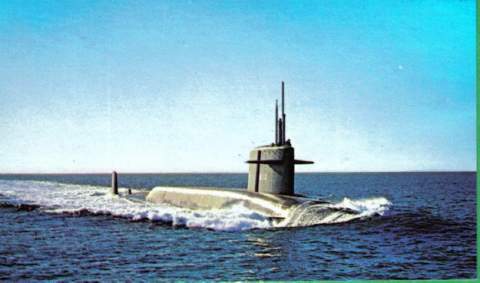 As of the beginning of 1980, the fleet ballistic missile submarine continued to conduct deterrent patrols from her base at Guam.